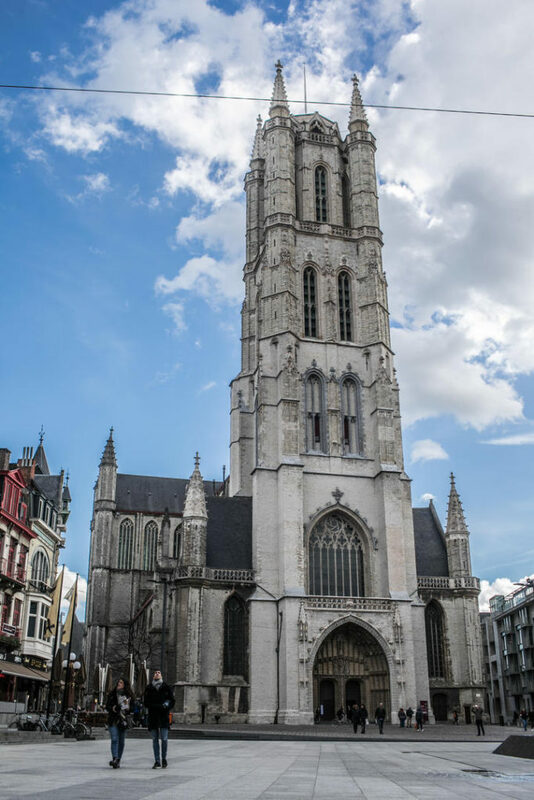 The recent MALMECC workshop in Liège provided an opportunity for me to follow in the footsteps of Philippa of Hainault: by visiting Ghent, where on 6th March 1340, Philippa gave birth to her third son, John of Gaunt, later duke of Lancaster and father of Henry IV of England. ‘Gaunt’ is a Middle English corruption of Ghent. I think it’s possible that Philippa named her son after the patron saint of the city of Ghent, St John the Baptist. The city’s oldest parish church was dedicated to St John the Baptist. Rededicated around 1540, today it is better known as St Bavo’s Cathedral. 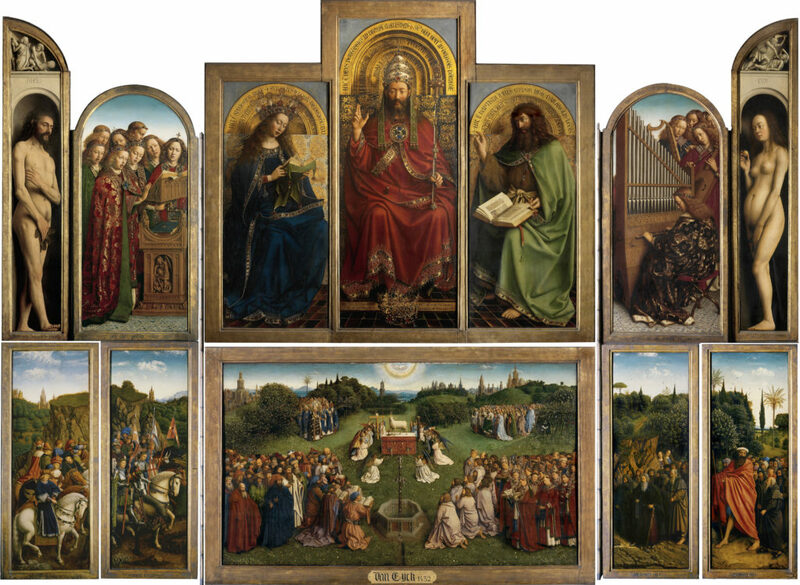 St Bavo’s is the home of one of the most important works of art in late medieval Europe, the 11ft by 15ft Ghent Altarpiece (c.1432). 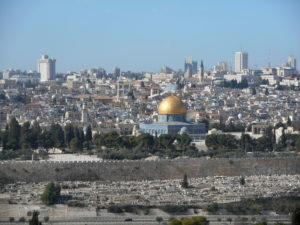 Albrecht Durer visited it on a journey to the Netherlands in 1521, writing in his diary that it was: ‘a most precious painting, full of thought’ (‘ein über kostlich hoch verständig gemähl’). 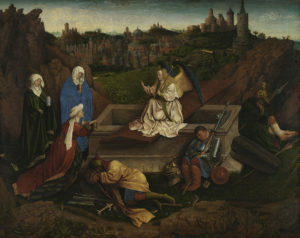 Originally commissioned sometime before 1426 by a wealthy member of the urban patriciate in Ghent, Joos Vijd, from local artist Hubert van Eyck, the work was completed in 1432 by his more famous brother, the renowned Flemish artist Jan van Eyck. The work was made for the chapel personally founded by Joos Vijd in 1435 to celebrate a daily Mass for the soul of himself and his wife, Elisabeth Borluut. 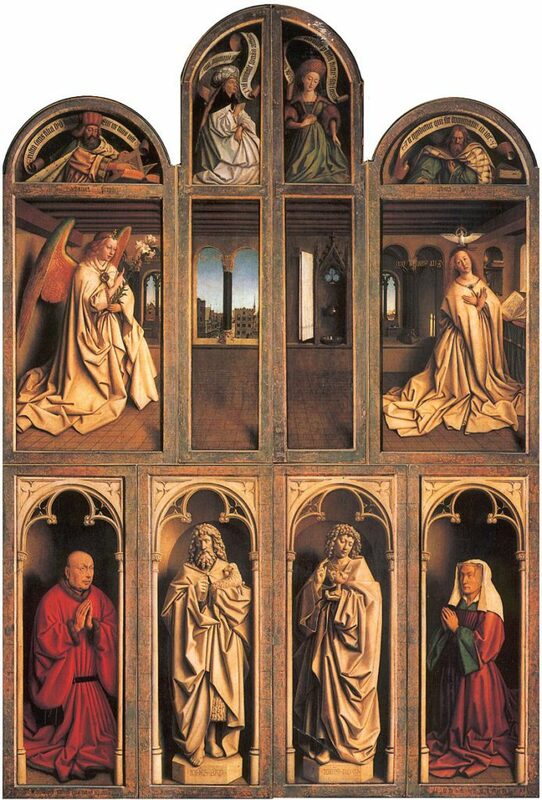 They are depicted on the sides of the altarpiece when it is closed, below an image of the Annunciation to the Virgin and grisaille (grey) images of St John the Baptist and St John the Evangelist. At the very top of the closed panels are sibyls and prophets. Jan made a ‘secret and far trip’ on Philip’s behalf at the same time, perhaps visiting cities in the Ottoman Empire. In 1428, he visited England and Spain on his way to Portugal, to help negotiate Philip’s third marriage to the Infanta Isabella of Portugal. 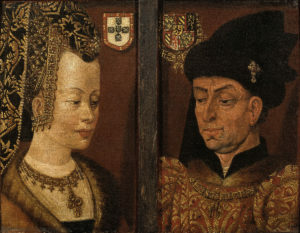 Jan van Eyck painted two portraits of the princess to send back to Burgundy, and was again able to go on pilgrimage, this time to Santiago de Compostela. Thanks for reading – we’ll have more of Laura’s thoughts on the altarpiece next week! Barbara Haggh, ‘The Mystic Lamb and the Golden Fleece: Impressions of the Ghent Altarpiece on Burgundian Music and Culture’, Revue belge de Musicologie / Belgisch Tijdschrift voor Muziekwetenschap 61 (2007): 5-59.